To mark the DVD release of The Short Films of David Lynch, which coincides with a new print of Eraserhead, Alex Fitch sat down with the artist Tom Humberstone to discuss Lynch’s short films within the context of his career as a whole as well as their relation to late 20th-century filmmaking on both sides of the Atlantic. Alex Fitch: They do look like visions of a disturbed mind, so perhaps you were in exactly the right mental condition to appreciate them! AF: You mentioned Lynch when we were talking about Dark City last month – you said both his shorts and features, like Mullholland Drive, have a very elliptical dreamlike quality where things are presented as if in a traditional narrative, but that the images don’t actually add up to anything. TH: Absolutely, they wash over you like a dream. There comes a point after the first act of most of his films where you give up trying to figure it all out and you give in to the dreamlike narrative and take from them what you can! Approaching the shorts on the DVD, I was reminded of my problem with experimental shorts and art-house films in general: if you’ve got the possibility of moving imagery and audio to accompany it, and you’re dealing with what is predominantly a narrative medium, I feel you have a responsibility to your audience to create something that does flow from a beginning to an end point. AF: In terms of an emotional arc, if not one that makes actual narrative sense? AF: In the introduction to his first short, Six Men Getting Sick, he says that he came to film as a painter who just wanted to animate a painting, but that after manipulating a moving image he wanted to become a filmmaker. TH: That was an interesting film. Certainly the animation that was used in his early shorts is quite accomplished and reminiscent of early Terry Gilliam. I would be interested to find out if Gilliam was working concurrently and if one of them was influenced by the other? AF: I think Gilliam started doing animation at art school earlier, but didn’t get his cartoons on to TV until after Lynch had made his first couple of shorts. Gilliam studied in LA and then moved to England to work on British TV while Lynch made his shorts in Philadelphia and then moved to LA to make Eraserhead. I don’t know how long it was before Monty Python appeared on American TV. 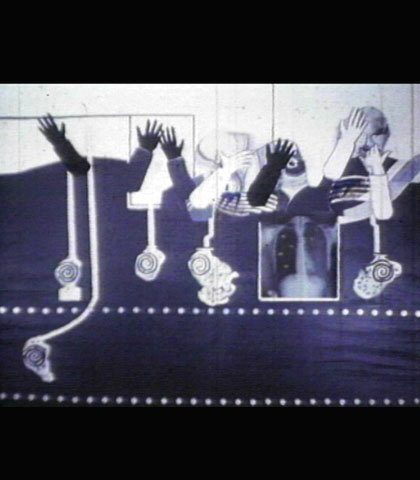 Maybe there was just a certain school of thought in experimental animation in America at the time! TH: Absolutely! I found the imagery really interesting – even then it was clear that he had a way with images – and there are stylistic conceits there that are fascinating already, but Six Men Getting Sick is an incredibly difficult short to watch. The police siren was hell! Once I’d seen the sequence and realised it was just going to repeat six times, I questioned why I was still watching it. TH: Maybe that’s the point, but I don’t care, it infuriated me! It reminded me of that scene in Ghost World, where the teacher shows this black and white film that she’d made, and it’s just her repeating the words: ‘Mirror, Father, Mother’ and so on. TH: If Six Men hadn’t been by David Lynch, would we be watching it and thinking, ‘Oh god, another terrible art student film’? AF: The point is, if it wasn’t by David Lynch, it wouldn’t be on the DVD. It is interesting watching these films as the ‘archaeology’ of David Lynch, seeing him form his ideas. Maybe we expect too much of them. They were never meant to be shown to fans of a successful art-house filmmaker 30 or 40 years later. TH: …yeah, but it was nice to see David Lynch with a sense of humour by that stage! Basically, watching the shorts made me really glad that he ended up making features. His ideas and his stylistic approaches were given a structure. There were some really lovely visuals and concepts in the shorts, but what he really needed was the framework that you get from having to make a 90-minute film. AF: Although it’s a shame that like Gilliam, he gave up animation. There are things he learned as an animator – like changing the speed of the camera and filming things backwards – that crop up in his later work, but no actual animation appears in his features, which is a shame because it works really well when it’s juxtaposed with the live action in shorts like The Grandmother and The Alphabet. There’s something profoundly dreamlike in those contrasts that he never quite got back to, no matter what tricks he used in terms of lighting or narrative or script construction in his later films. TH: The Amputee was horrible! TH: All his actors are so cold and stiff! AF: …to the extent that there are scenes in The Grandmother, where he’s just using his actors as human puppets. He shoots a frame of them, moves their limbs a little bit, shoots another frame, moves their limbs a little bit more – he might as well be using mannequins instead of real people!